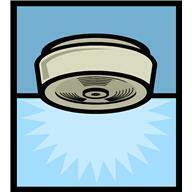 Did you know the smoke detectors in your home may contain radioactive material? Many smoke detectors contain a small piece of a radioisotope called americium-241. This is what alerts you if your house catches fire – the americium ionizes the air, making it conductive, so that any smoke particles that enter the unit reduce the current and trigger the alarm. Does your watch glow in the dark? Very handy in theaters if the movie’s boring. That feature could be tritium (hydrogen-3) or promethium-147. Older clock dials and watches used radium-226. Night sights for guns often use tritium. So you see, some consumer products function because of radioactive material. And you may have guessed by now that the NRC has something to say about that. The agency has a policy statement on consumer products, published in 1965 by the Atomic Energy Commission, which we are currently proposing to update. The policy statement incorporates the three fundamental principles of radiation protection: Justification of a practice; optimization of protection (the “As Low As Reasonably Achievable” practice, or ALARA); and application of dose limits to individuals. For example, under the policy, approval of a proposed consumer product depends upon both associated exposures of persons to radiation and the apparent usefulness of the product. The policy calls for monitoring the amounts of radioactive materials being distributed for use by the general public and reconsidering the policy if there is any indication that materials in products reaching the public may result in a significant fraction of the permissible dose. Well-informed regulatory decisions in this area can have a significant effect on minimizing cumulative exposures to the public. The NRC does not, however, approve consumer devices with radioactive material simply because they are cool. A proposed product must pass our “frivolous use” standard – meaning the radioactive source provides a benefit. Glow-in-the-dark trinkets need not apply. So as you putter around your house, you may receive a very small radiation dose from the smoke detectors on your ceiling – but the possible life-saving benefit of those devices far outweighs any radiation risk. They are an example of the beneficial uses of radioactive material, and of how the NRC protects the public. Radon emitted from deep-shaft mines is naturally occurring radiation and would not be under NRC jurisdiction. It would fall under the Bureau of Mines or OSHA as an occupational health issue for minors. Waste residue (not necessarily gases) from uranium recovery (conventional mills and/or in situ leach facilities) is under NRC jurisdiction and you can find the relevant regulations in 10 CFR Part 40 Appendix A for uranium tails impoundments. The iPhone is a very large part of my life and I don’t give a thought to the radiation that is emitted. I know there are cases that dissipate the radiation over a surface but I prefer others. I just hope the phone itself as it advances technologically will use less and less radiation. What are the regulations regarding radioactive gas produced by mining? I doubt that the radiation emitted by these devices greatly affect health, we also carry devices that emit radiation into our pockets, cell phones emit harmful radiation and have all day glued to the head. Do the sellers of these devices warn consumers of the risk. If not perhaps it should be a requirement.